The world’s most advanced sensor package powered by DAQRI’s proprietary computer vision suite, Intellitrack. Intellitrack turns any industrial environment into a canvas for 4D content, from in-context training applications to augmented work instructions and beyond. High-resolution 3D-depth sensor and 360 degree navigation cameras for object recognition, environment mapping and 3D reconstruction of any facility. Hands-free wearable True 4D Display positioned beneath a protective visor allowing the wearer to see 4D work instructions in the context of the job being done. In addition to seeing 4D content through the helmet display, users will have the ability to touch and control the interface through integration with other wearables, such as smart watches. Support for HD video recording, photography, 3D mapping, and alphanumeric capture, allowing the Smart Helmet to read and understand signage and instrument data. An intuitive user experience driven by DAQRI’s 4D authoring program, Industrial 4D Studio. Battery life that lasts an entire shift, with modular battery packs that can be swapped for unlimited continuous use. 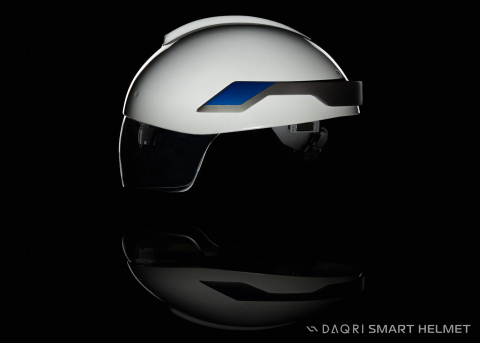 The DAQRI Smart Helmet will be available for order in October 2014 and is expected to begin shipping in December. DAQRI Industrial 4D Studio will be available later this month by invitation. For more information on DAQRI industrial 4D solutions, please visit: www.industrial.daqri.com. Enterprise augmented reality company DAQRI is leading the 4D revolution, having developed the technology to deliver the most sophisticated augmented reality services and applications to clients in the fields of industrial, education and storytelling. The company has already powered more than 2,500 augmented reality experiences for the world’s biggest companies including Ford, Huntington Ingalls Industries, Twentieth Century Fox, SONY, Cadillac and more. DAQRI is headquartered in Los Angeles with an R&D center in Mountain View, Calif. and sales offices in New York, Chicago, Boston, Detroit, Atlanta, and Minneapolis. Advisory board members include Ashton Kutcher, actor and investor; Troy Carter, CEO, Atom Factory; and D.A. Wallach, recording artist. DAQRI announces its Smart Helmet, a professional-grade head-mounted display for industrial environments. The helmet provides real-time information to workers via DAQRI 4D/augmented reality technology.